Melbourne's leading Decking builders of high quality Merbau, treated Pine & Composite Decks. Ph 0451 022 041 for a free, no obligation on site quote. 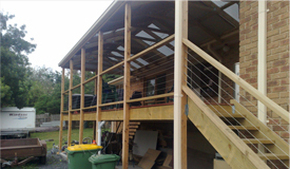 Looking for Decking Builders in Melbourne? Considering a home improvement project or special addition to your property? Want friendly advice and service, impeccable workmanship and great value for money? Master Decking Builders, DECAID, are at your service. As leaders in Design, Material Selection and Deck Construction, we’re here to bring your dream Outdoor Leisure project to life. We at DEC/AID, are specialist builders of decks, pergolas, carports, verandahs, handrails & steps, privacy screens, pool decking, Composite Decking and associated projects. We also undertake decking repair and deck replacement work on existing structures, both minor and major. Our team has successfully completed a multitude of projects, from small fixes to total makeovers. Whatever you need to bring your exteriors up to scratch, we’re here to help. To discuss your needs, ideas and sources of inspiration with a member of the DEC/AID team, contact us online or give us a call on 0451 022 041. Upon viewing the sample photos of DEC/AID's successfully completed projects, you will feel inspired as a world of opportunity presents itself. With over 12 years of experience in the Decking trade dealing with satisfied customers, we have come to know the high expectations of our clients. We take the time to understand your needs and aspirations, from the overall project concept, to the design phase to minor details that might otherwise be overlooked. 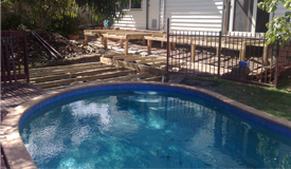 For more on how we can help make your Timber Pool Deck project a reality, contact us via the form above. At DEC/AID we offer free advice on material selection, the "pro's and con's" of various Timber Decking products on offer. 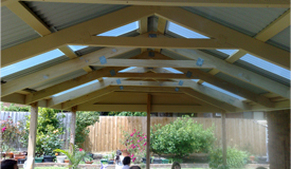 For more on how we can help make your Pergola or Verandah Roof project a reality, contact us via the form above. DEC/AID offers friendly highly experienced contractors with references and a wealth of on-site knowledge to ensure the smooth completion towards your "Lifestyle" project. One phone call or an online message to Matthew (see "contact us") will begin the process of seeing your dreams become a reality. Your complete satisfaction is our goal! So please don't delay, contact us today to arrange a free no obligation appointment to discuss your personal requirements. For more on how we can help make your Handrails & Steps a reality, contact us via the form above. Part of the Timber Decking Now Decking Builders Melbourne Group. Ph 0451 022 041 for a free quote. DECAID copyright 2003 - 2018 - All Rights Reserved.